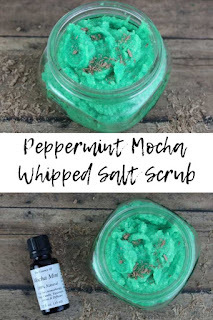 This peppermint mocha whipped salt scrub recipe is made with an emulsifier, so it turns into a lotion when you rinse it off. The scent is made from an all natural chocolate mint blend. 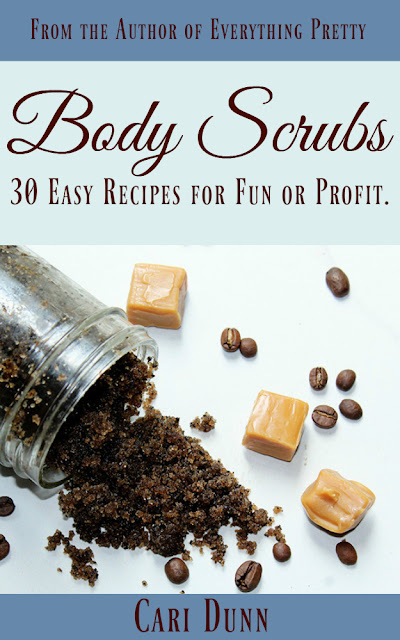 I've made a lot of body scrubs over the years. I mean a lot of body scrubs. 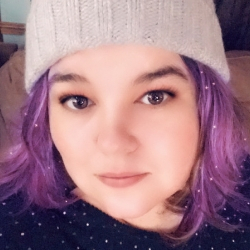 I love making them because they are easy to use and really help keep my skin from getting overly dry in the winter. For as many scrubs as I've made, I had never made an emulsified scrub until recently. Before Christmas, I made a whipped gingerbread emulsified sugar scrub. I loved it so much, I made the same recipe for my DIY bath and body gift sets this year. As much as I loved it, I wanted to make a whipped salt scrub because my hands are crazy dry this winter. Epsom salts have a lot of benefits for your skin, and we will get to those in a minute. I decided to make this a peppermint mocha whipped salt scrub recipe. Just before Christmas, I went to the store that sells Crafty Bubbles and picked up some of their new natural blends. Yes, you read that right. 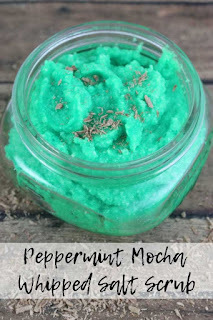 This mocha mint scent is all natural! Most of my body scrubs use cup or tablespoon measurements, but this one is measured by weight. Since you use emulsifying wax and a preservative, it's very important to weigh this recipe using a digital scale . You'll also need a hand mixer. I don't use my stand mixer unless I'm making at least four of these at a time because it's just not enough liquid to get a good whip. I wanted to use Epsom salt in this whipped sugar scrub for a few reasons. My skin gets crazy dry in the winter, and salt does a better job at removing dead skin cells than does sugar. Epsom salts also help unclog pores and improve circulation as you scrub your skin. Epsom salts have magnesium, which can be absorbed through the skin. Epsom salts help flush away toxins and reduce inflammation in your skin. Epsom salts also have minerals in them that can help improve the health of your skin. I used apricot oil in this recipe because it's a fairly light oil. Since it's an emulsified scrub, the oil stays on your skin after you rinse it off. Apricot oil soaks into your skin faster than other oils, so your hands won't be oily after you use this scrub. Apricot oil is high in vitamins A and E to soothe your skin and provide powerful antioxidants to your skin. The gamma linoleic acid in the oil helps firm the skin. 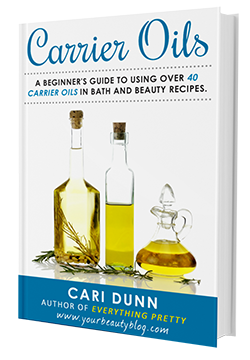 You can use any carrier oil in this recipe, but I wanted a lighter oil. You could also use sweet almond oil, fractionated coconut oil, avocado oil, or argan oil. Emulsifying wax is what makes this salt scrub turn into a lotion when you use it. It binds with both oil and water, so when you rinse off the scrub, it binds with the water and creates a lotion. Emulsifying wax is probably the most popular emulsifier. 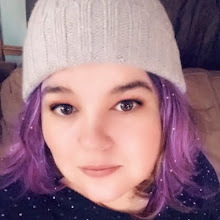 There are others that you can use, but I like this. It's inexpensive and can be used in a lot of recipes. I added stearic acid because it helps cleanse the skin while you scrub. It also contains essential fatty acids, so it helps moisturize your skin. Cocoa butter is a solid at room temperature, so it helps this whipped salt scrub recipe get firmer after it sets up. Cocoa butter is high in antioxidants to prevent the signs of aging. It also helps moisturize your skin to prevent dry skin. Coconut oil is also solid at room temperature, so it helps gives this recipe some bulk. Coconut oil whips very well, so I like using it in whipped body scrubs. It's naturally antibacterial, so I like to use it when my skin is dry and prone to cracking. Coconut oil can penetrate deeper into the skin for longer lasting moisturizing. The fatty acids in it help moisturize and relieve dry skin. I've been looking for a natural chocolate scent for years, and I found it! Crafty Bubbles just released a set of natural fragrance oils. 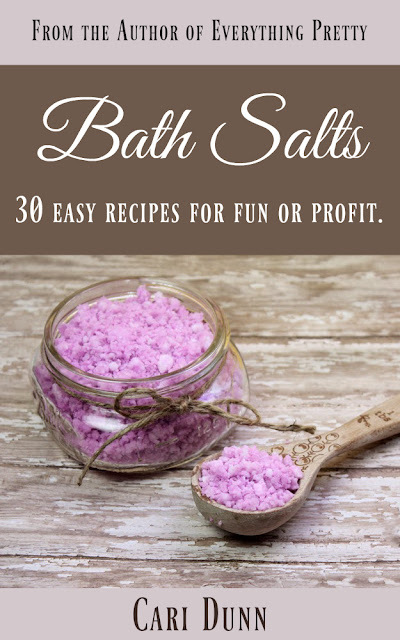 They are a blend natural flavors and essential oils that can be used in soaps, candles, or diy bath and body recipes. They aren't on Amazon yet, but you can get them directly from Crafty Bubbles. They are so new that they aren't in their catalog, but you can find more information on their Facebook page. I added a little bit of vitamin E oil because it's a great antioxidant. 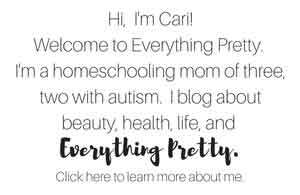 I use the Crafty Bubble vitamin E oil because it's so thick and works so well. When my cuticles get really dry, I use vitamin E oil straight on them to heal them quickly. Technically, body scrubs don't need a preservative because they don't have water in them. I've been adding one because I dip wet fingers into the scrub, and I don't want any creepy crawlies to grow. Phenonip is probably the most common preservative for sugar scrubs and salt scrubs. It protects against fungi, bacteria, and mold. I used methylparaben because it's what I have in stock. But it's a paraben and parabens are bad, right? Well, so is having bacteria or mold in your sugar scrub! Besides, phenonip is actually several types of preservatives in one product, including methylparaben, ethylparaben, and propylparaben. You're using such a small amount that I feel that the benefits outweigh the risks. Weigh the emulsifying wax, stearic acid, cocoa butter, and coconut oil and place in a Pyrex measuring cup or other glass bowl. Melt in a double boiler until completely melted. Add the apricot oil and use a laser thermometer to check the temperature. Once it's under 175 degrees F, add the fragrance, colorant, vitamin E oil, and colorant if you're using it. Set it in the freezer for 10 minutes. The edges should start to harden. Use your hand mixer and the whisk attachment to beat the oils until they are light and fluffy. Measure the Epsom salts and add it to the oils. Whip again or stir by hand. This recipes makes 8.5 ounces of peppermint mocha whipped salt scrub. I've made four batches at a time with no problems.